Is corn the new milk? Evolutionarily speaking, that is. It is a widespread misconception that, as we developed the technology to reshape our environment to our preferences, human beings neutralized the power of natural selection. Quite the opposite is true: some of the best-known examples of recent evolutionary change in humans are attributable to technology. People who colonized high-altitude environments were selected for tolerance of low-oxygen conditions in the high Himalayas and Andes; populations that have historically raised cattle for milk evolved the ability to digest milk sugars as adults. A recent study of population genetics in Native American groups suggests that another example is ripening in the experimental fields just a few blocks away from my office at the University of Minnesota: Corn, or maize, may have exerted natural selection on the human populations that first cultivated it. The target of this new study is an allele called 230Cys, a variant of a gene involved in transporting cholesterol. 230Cys is known only in Native American populations, and it’s associated with abnormally low production of HDL cholesterol (that’s the “good” kind of cholesterol) and thereby increased risk for obesity, diabetes, and heart disease. In Native American populations, the genetic code near 230Cys shows the reduced diversity associated with a selective sweep, which suggests that, although it’s not particuarly helpful now, this variant may have been favored by selection in the past. One of the biggest dietary changes in the history of Native American humans was the domestication of corn, which provided a staple crop to support settlements across North and South America long before Europeans arrived. However, a staple crop is something of a double-edged sword: it can provide a more predictable food source than hunting and gathering—but if the crop fails, it means famine. It’s been proposed that the 230Cys variant makes people who carry it better at storing food as fat, which might come in handy for ancient farmers who had to weather bad harvests every few years. So the new study looks for an association between frequencies of 230Cys and corn-based agriculture in Native populations from Central and South America. 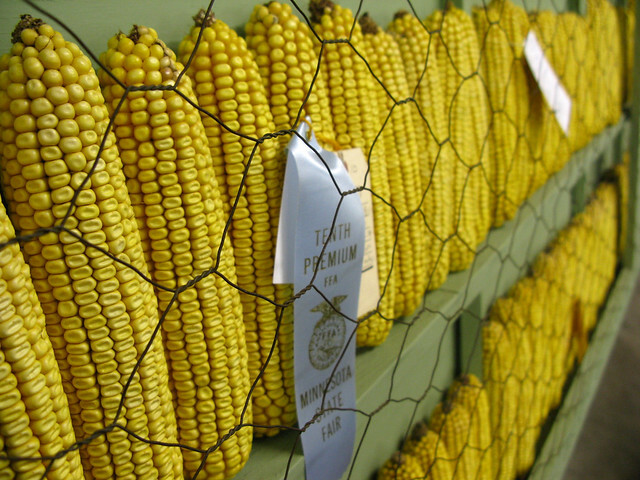 The study’s authors—a big international team from universities in Brazil, Argentina, Mexico, Chile, Costa Rica, France, and Great Britain—first show that there’s a strong correlation between the frequency of Cys230 in Native populations and the length of time that domestic corn has been grown by those populations, as determined by the radiocarbon date of maize pollen found in archeological sites. That is, 230Cys is more common in Native populations that have a longer history of growing corn. The team also used genetic data from the vicinity of Cys230 to estimate the age of the allele, and found that it probably originated between 19,000 and 7,000 years ago—which is to say, all the copies of Cys230 in the population genetic sample are descended from a single mutation that occurred after humans colonized the Americas. The lower age estimate is also pretty close to how long ago native populations are thought to have first begun farming maize. That data makes a pretty good case for 230Cys having arisen as an adaptation to the diet created by Native American corn-based agriculture. But it’s not the whole story, by a long shot. Although 230Cys is strongly associated with metabolic disease in today’s modern, mostly famine-free, lifestyle, it only explains about four percent of variation in blood cholesterol levels. Moreover, it’s not clear to me that agriculture based on maize should be more prone to famine than agriculture based on wheat or rice—so why didn’t European and Asian populations evolve their own versions of 230Cys? It seems much more probable that there are a lot of other genes involved in determining how human bodies respond to modern-day feasting or prehistoric famine. And, in fact, a 2010 study of world-wide human population genetics found evidence of selection associated with both climate and with diet type across the genome. That study found genetic markers with strong associations to climate and diet in close proximity to genes connected to blood glucose levels, diabetes risk, cancer risk, and, yes, blood cholesterol levels. The climate and dietary categories examined in that study are very broad, however, so it’s hard to know what, specifically, helped create the natural selection suggested by the observed associations between gene variants and evironments.